Not long ago, for an Apple Seed episode about college stories, I found myself writing a piece about Mark Henderson, who was responsible for awarding me with a spot in the Weber State University vocal jazz ensemble and a scholarship to boot. That gig and that scholarship made it possible for me to go to college at all, and for that and other reasons, Dr. Henderson became a prominent figure in the formative years of my University education. In one of our first meetings, in the cool summer of 1989, Dr. Henderson drove a group of music students to the bucolic Trappist monastery in Huntsville, Utah, to listen to the monks sing Vespers. We sat in the loft and watched and listened as the Abbey’s 27 monks moved to their seats and worshipped together in sung prayer. It was an experience that illustrated the impact – and also the complexity – of singing together in unison: listening to one another, breathing together – many singers, all settling into the same space in mind, heart, and voice. It inspired reflection and reverence for me as a singer and as a worshipper, and those feelings were potent enough that I promised myself to revisit the monastery and hear them again. I kept that promise only very, very occasionally, making time for the drive only about once per decade to Hunstville. But last autumn, occasion presented itself. And after many years away, I drove to the monastery on an impossibly lovely rainy day with Suzanne and Leah. We walked into the chapel and ascended the stairs to the loft, where we waited quietly for Vespers to begin. Into the chapel, one by one, came the monks. Seven of them. They were, by and large, seven of the same monks I’d seen when I had first visited the monastery in 1989, almost three decades ago. These seven are all that are left (the monastery was founded in 1947 by 32 monks, who lived at first in WWII era military barracks. In the monastery’s heyday, there had been as many as 84 monks and novices). On this visit, the monks spoke the prayers together. They don’t sing anymore. After the prayers, the seven of them silently shuffled out of the chapel. Watching them leave, I was filled with thoughts of those things that are ephemeral – things worth treasuring while we have them, because in time they will go away completely. It occurred to me that most of the systems we observe are more cyclical than ephemeral: we watch graduating seniors leave a school, and we watch students take their place. We watch parents have children, and then we watch those children grow and have children of their own. It’s like standing on the bank watching a river: more water always flowing by, the water flowing by us in this minute very much the same as the water that flowed by a minute ago or an hour ago, and very much like the water that will flow by a minute or an hour hence – enough water coming in that the water going out doesn’t leave so much as a moment's empty space. But the monastery is a closed set – water flowing out, but no new water flowing in. 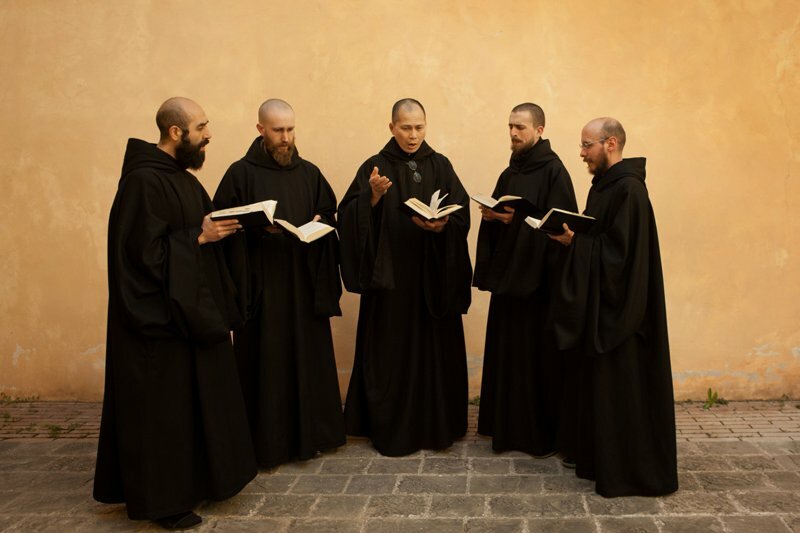 The arc of the monks’ story rose in the 40s as young men singing with strong voices worked the monastery’s land (1,800 acres of it) with strong hands. Those young men lived deliberately through the monastery’s salad days of the 1960s. But they’re going now. The singing is done, and the land is being rented off slowly to neighboring farmers. Plans to phase out the monastery completely as its inhabitants leave us are in motion even now. My autumn visit to the monastery seemed to me an illustration of both the importance of storytelling, and also the limits of it. The challenge for storytellers, perhaps, is not only to observe the important things in their experience for the sake of recording them, but also for the sake of participating in them fully as they’re happening. After all, even the most skilled tellers can bring back only a picture of the things that happen. They can’t bring back the things themselves. Tellers will work to tell stories of the monastery. But we won’t be able to bring back the sound of the songs. While they were being sung, let’s hope we listened. Welcome to a day in the life of the Matt Townsend Show team. Perhaps the Matt Townsend Show isn’t on the same level as a Hollywood blockbuster, but for those who listen, Matt is always endearing, witty and fun to listen to on-air. While all of these things are true, he is the first one to remind us that what is happening behind-the-scenes is just as important as what is happening live on air. Because, like in Hollywood, what is happening backstage is really what creates the magic on screen. Fortunately, being a producer for Matt Townsend is the best job, ever. He may well be the greatest boss in the world, or so Matt says. Our team is made up of a head producer-Terry South-who helps all of the student producers do their job right. The board-op runs the technical operations during the morning show, and the student producers help book guests and put together segments. We work with Matt and Terry to find different types of guests under different genre’s like business, psychology, world news, and human interest stories. We all do a lot of digging into stories that we think could add something to the show and the lives of those listening. The producers then send the idea to Matt and Terry and if they like it, we go ahead and search all over the world wide web until we can find contact information for the guest which we then use to try and book them for the show. As producers, booking guests is always exciting. You see, our entire team shares a Google calendar that has the dates and times of the segments that we can fill in with our guests. It’s a really great system until you realize that you have emailed a guest about a time, they’ve agreed, and then later find out that another producer has already filled that exact time slot. Then you have to start over with that guest which makes us feel both exasperated and nervous. But eventually, we find a day that works for both the show and the desired guest, get them put on the calendar and discuss topics that might come up for the interview. Then, a few days before the interview, you create a set-up sheet for the interview which is basically just a big paper that gives Matt all the necessary information for the interview and some possible questions to ask. That goes to Matt the morning before the show, and then Matt works his magic to make the interview interesting and exciting to listen to. While listening to the morning show, you can learn a lot about Matt and you may come to find some really strange things about him. During the end of the last hour, Matt likes to collaborate with the Sports Nation folks and talk with them. Most of what they talk about is completely ad-libbed, or made up on the spot. A few weeks ago, if you were tuning in, Matt and Sports Nation talked about what types of emotional pets they would have if they could. Apparently, he told us all he would pick a goat, because what isn’t soothing about a goat, right? You can always count on Matt to keep things weird during the show. Working as a producer for The Matt Townsend Show is fun, exciting, crazy, and rewarding. We love that our listeners care about the topics that are chosen, and all of us on the Matt Townsend Show team hope to continue to make things both engaging and weird for you all.